Yearly plan release giveaway campaign event! Thank you for using AWA as always. 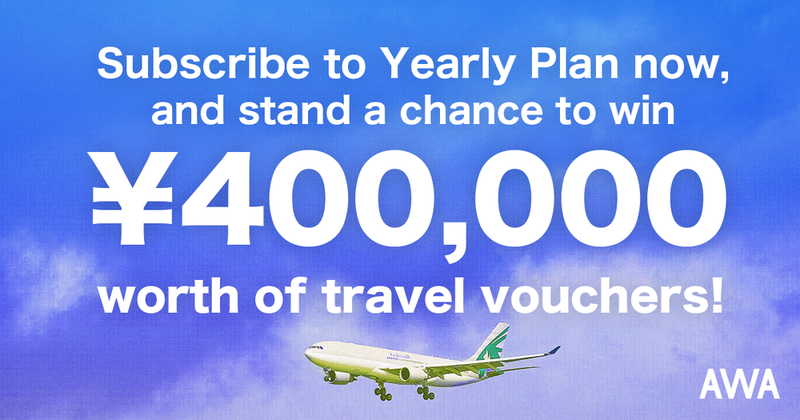 To celebrate the release of our yearly plan, we are giving away a ¥400,000 travel voucher to one person drawn by lottery from those of you who subscribed to yearly plan during the application period. We are giving away a ¥400,000 travel voucher to one person drawn by lottery from those who subscribed to yearly plan during the application period. 7/26/2018 (Thu.) - 10/1/2018 (Mon.) at 3:00 p.m.
We will announce the winner using AWA's push notification function. We ask that the winning individual please follow the procedure in the winner notification to go through the process to receive your gift. If you do not go through the process in accordance with the stated method, we will not be able to ship your gift. We appreciate your understanding. Only people residing in Japan may apply. Gift item may change without notice. This campaign is offered by AWA. To contact us, please go to the in-app menu and then "Settings" > "About" > "Contact"
Those signing up for the first time to the yearly plan will get renewed automatically at the end of the free period.